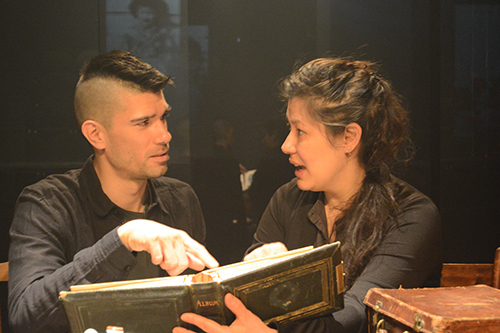 Playwrights and actors Julie Tamiko Manning and Matt Miwa with director Mike Payette breathe new life into these memories. They shift from character to character, weaving personal tales into the here and now. Through their eyes and in the individual voices and personalities, we learn about how deathly cold the winters and impossibly hot the summers were in the camps; how their main sources of water would freeze. We learn about the need to ration food, and how the kids would find ways to stay entertained and how the older kids managed to find love. Part of the effectiveness of this production is the beautiful set and staging that provide a dream-like quality to the show. The gentle haze across the stage paired with sets of screens where names in Japanese shift to old black and white photos provide the perfect accent. The entire production team, in particular set and costume designer James Lavoie, video designer George Allister, and lighting designer David Perreault Ninacs have done outstanding work here. What strikes me the most about The Living Archives is simply just that, they’re living. The Nisei are still here and these stories are their stories, their lived history that Canada failed to recognize or acknowledge for far too long. A map or the Tashme camp is posted just outside the theatre at Factory and along with it is a collection of pins. If you or your family were kept at Tashme during the war, you are encouraged to stick a pin in the cabin where you were held. As revealing and emotional as these stories were, seeing people immediately take to the map to add their pins resonated deeply with me. The Tashme Project: The Living Archives is something I feel everyone should see and learn about. Canada is not guilt-free when it comes to atrocities committed during times of war and it’s about time Canadians learn more about that time and recognize it. This is a great eye-opener and I’m looking forward to what the next chapter will be. The Tashme Project: The Living Archives is playing at Factory Theatre (125 Bathurst St) until February 10 2019. Performances run Tuesdays through Saturdays at 8:00 pm with weekend matinees at 2:00 pm. Tickets are $50 general admission, $40 for seniors, and $30 for students. Tickets can be purchased online, over the phone by calling 416 504 9971, or in person at the box office. Audience Advisory: Run time is 80 minutes with no intermission. This production uses theatrical haze.